Welcome to CORX & XITA! A toast to CORX ! 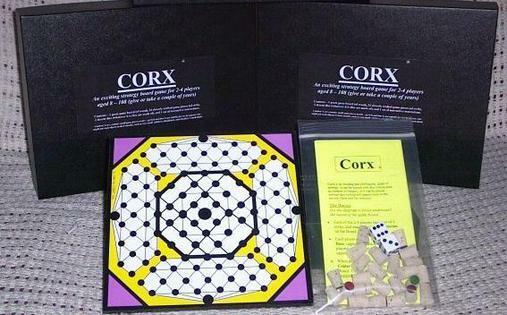 CORX is a fun board game that can be enjoyed by people of all ages. The game consists of an 8" x 8" wooden game board and 24 corks (as well as 2 dice for the dice version). The object of the game is to score the most points, by capturing the corks other players, or any other player's "Base". Each of the 2-4 players has a set of 6 corks, and one of the four territories on the Board. For Classic CORX, movement is game pieces is determined by a role of the dice. For Master CORX, each player has a "movement pool" of 6 spaces for which 2 corks must be moved 1-5 spaces each ( to total 6 spaces). Each player must try to protect her Base, capture the corks of other players (by landing on them), and/or capture the Base of any opposing player. Players protect their corks by forming "Blocks" (2 corks positioned next to each other). 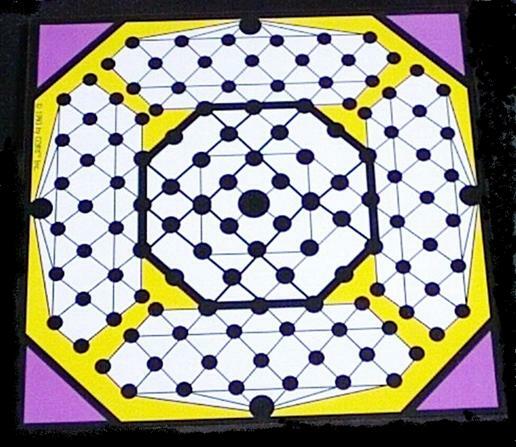 When possible, a player will occupy Center Space in the middle of the Board. This gives her privileges not available to the other players. When a Base is captured, the game is over.The player who has scored the most points wins the game! Points are scored by capturing a Base, by capturing corks, by avoiding capture, and by occupying Center Space when the game ends.